Stark and steely is the opening outcry of the Kopelman Quartet’s account of Schubert’s Death and the Maiden. The resolute progression of its aftermath is nervy and urgent but a pleading melody by the first violin is succeeded by a happy interlude (CD1 tr. 1, 1:38). Although this ends abruptly, it has prepared the way for a second theme of contentment (1:59). That said, you can’t rest in this performance recorded live by the BBC at the 2003 Edinburgh Festival: the progression now becomes frantic, all instruments engaged in wiry semiquaver passages before a more affirmative return of the second theme now tinged with melancholy. In the development its opening motif is frenetically examined. In the coda the harmonies are bleak and the first violin adds an elegy. Passionate and remorseless, the Kopelman (KQ) shows how well Schubert fuses all this material as the music swings like a pendulum from protest to rhapsody with the detail of emphatic motifs shared by instruments in turn. The exposition repeat seems different: the opening more declamatory, the second theme more a sad recollection of happiness than reliving it. This account is both moving and disturbing. I compared the undated recording by the Lindsay String Quartet (ASV CD-DCA 560, now licensed to Presto). The Lindsays (LSQ) start stunningly and, by contrast, their happy interlude is sweet and second theme dreamy, but their semiquaver passages have less grit. They play more beautifully than KQ but their development has less tension. Their eerie coda has a spooky finesse. The slow movement begins with the Death and the maiden theme from Schubert's song which KQ perform with dignity and sadness, a beauteous gravitas. It's still a fair Andante con moto, so a dance of death. LSQ are slightly faster but too smooth. There are five variations on the theme. In Variation 1 (tr. 2, 2:26) the theme appears on an animated first violin with an element of fragility against agitated triplets in second violin and viola. LSQ's first violin, Peter Cropper, places more focus on fragility than KQ’s Mikhail Kopelman's projection of personality. In Variation 2 (4:25) the theme is on the cello and while KQ's Mikhail Milman is grave, LSQ's Bernard Gregor-Smith is more doleful. In Variation 3 (6:28) KQ has more venomous tuttis and the interplay of first violin and cello is more spiky. The key changes in Variation 4 (8:20) from G minor to G major, so there's warmth from KQ fused with sadness because of the context. Their playing is full of feeling where LSQ prefers a more dreamy radiance. Back in G minor, the final variation (10:46) begins with a nervy expectancy from KQ where LSQ opt for eeriness. Milman provides the more graphic descents of the cello. Though the movement closes in G major with KQ seeming to sing 'all is fulfilled', the ambience is as chilling as their accent on the final soft chord. LSQ go for a happier resignation with the barest of closing accent. The Scherzo has two moods which KQ conveys distinctly. First there's a headlong momentum in rising phrases that will tolerate no delay but second, almost immediately, there are barbed descending phrases, as if to dismiss the need for this haste. Then there's the Trio, as in the slow movement a change to the major after the minor key, in this case from D minor to D major. KQ make this maternal in character but with a growing recognition of sad experience. When latterly the tune remains only in the viola and cello, with the first violin reduced to frittering decoration, the consolation is subverted. LSQ's Scherzo is sprightly but civilized and thereby comparatively tame. Their Trio is balmy with exquisite filigree work from first violin yet no underlying sadness. The tarantella finale is a hive of energy and contrast, now loud, now soft, now a crescendo. Yet KQ also convey an element of menace, where LSQ are more neutral in their brilliant execution. A big tune (tr. 4, 1:41) provides a moment of breadth, treated in sinewy yet also gleaming fashion by KQ. Here LSQ are tougher, less idealistic. KQ are more manic, even ecstatic, but this is only so the familiar 6-quaver-to-a-bar pulse can writhe around the tune. For LSQ Peter Cropper brings more charm to the first violin's high tessitura capers but KQ's prestissimo finishing straight is more exciting. The first movement of Tchaikovsky's String Quartet No. 3 is unusual in that its contrasting central section is longer than its outer episodes. KQ introduce it with a warm gravity, but there's soon the passion of protest. The first violin melody which is the nub of the outer sections is rich and emotive, grows in passion, sinks back exhausted but continues to repeat its essence. This is all achieved by KQ with movingly poised playing. In the central section the thoughts come more quickly, impatiently. One highlight of it is a tranquillo passage (CD2 tr. 1, 10:45), intensely defined by KQ but its gleam is icy. I wonder if this centre amounts to the variability of everyday life and its aspirations in contrast to the essence of the melody of the opening and close of the movement, whose sighing phrase at the end from first violin, echoed by viola and then cello, seems to contain all life's glory and disappointment. I compared the 1992 recording by the Keller Quartet (Apex 2564-68641-7). The Kellers (KE) bring a more externalized, ostentatiously dramatic character to the table. The emphasis of the outer sections' melody is more on suffering than beauty. However, their central section has a firmer contrast between the charming aspects and resolute climactic points, less fraught than KQ's. KE's tranquillo section is blazingly sunny. The second movement Scherzo is niftily done by KQ, though KE flounce more dynamic contrast which gives it a more prickly edge. The Trio, in which KQ linger a touch more soulfully, features a sombre tune in the viola, somewhat lightened when it reaches its upper register and more so when the first violin joins it. The third movement is a lament beginning with muted strings forte and then ff. KQ realize this as a grating, teeth-on-edge, sound and for me this seems closer to Tchaikovsky's intention than KE's more dispassionate, orderly treatment. A grave chant follows, to which KQ imparts an element of consolation not in KE's neutrality. The first violin solo, marked 'weeping and very expressive' (tr. 3, 3:41) comes veiled and fragile from KQ's Mikhail Kopelman and when he has the same theme marked 'dolefully' (6:05) you feel this is fresh, raw grief. KE's András Keller gives you a beautiful aria. ​The variety of elements in this movement, better displayed by KQ, make it painfully absorbing until its high closing chords seem to reach up to the heavens. The finale is a rip-roaring romp, a riot of energy to which KQ bring more than a touch of manic abandon and an exhilaration that sweeps you away. There's some contrasting delicacy too. KE are more sprightly in all of this yet lack KQ's sheer heart, so their account becomes a disciplined triumph of technique. 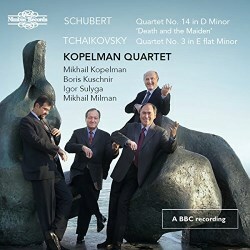 This could summarize these two CDs: while other quartets execute the music well, the Kopelman Quartet lives it, heart and soul.